DataMatrix object, matrix, or vector of gene expression values from a single experimental condition. If a DataMatrix object or a matrix, each row is a gene, each column is a sample, and an average expression value is calculated for each gene. If the values in DataX or DataY are natural scale, use the LogTrans property to convert them to log 2 scale. Column vector of p-values for each feature (for example, gene) in a data set, such as returned by mattest. DataMatrix object containing p-values for each feature (for example, gene) in a data set, such as returned by mattest. Cell array of character vectors or string vector containing labels (typically gene names or probe set IDs) for the data. After creating the plot, you can click a data point to display the label associated with it. If you do not provide a LabelsValue, data points are labeled with row numbers from DataX and DataY. Property to control the conversion of data in DataX and DataY from natural scale to log 2 scale. Enter true to convert data to log 2 scale, or false. Default is false, which assumes data is already log 2 scale. Lets you specify a cutoff p-value to define data points that are statistically significant. This value is displayed graphically as a horizontal line on the plot. Default is 0.05, which is equivalent to 1.3010 on the –log10 (p-value) scale. The value must be between 0 and 1. You can also change the p-value cutoff interactively after creating the plot. Lets you specify a ratio fold change to define data points that are differentially expressed. Default is 2, which corresponds to a ratio of 1 and –1 on a log2 (ratio) scale. You can also change the fold change interactively after creating the plot. Controls the display of the volcano plot without user interface components. Choices are true or false (default). If you set the 'PlotOnly' property to true, you can still display labels for data points by clicking a data point, and you can still adjust vertical fold change lines and the horizontal p-value cutoff line by click-dragging the lines. Structure containing information for genes that are considered to be both statistically significant (above the p-value cutoff) and significantly differentially expressed (outside of the fold change values). The fields are listed below. mavolcanoplot(DataX, DataY, PValues) creates a scatter plot of gene expression data, plotting significance versus fold change of gene expression ratios of two data sets, DataX and DataY. 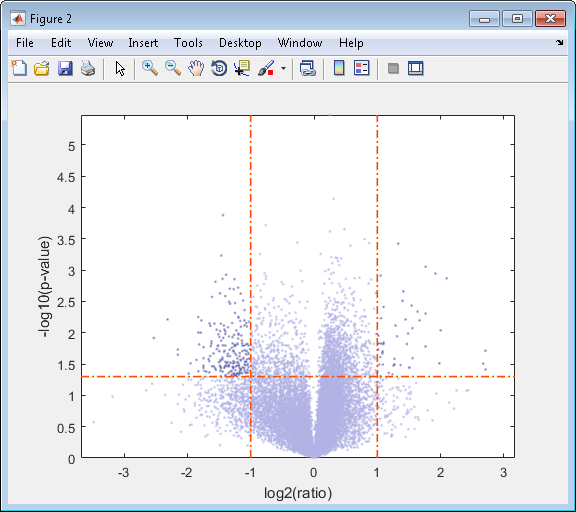 It plots significance as the –log10 (p-value) from the input, PValues. DataX and DataY can be vectors, matrices, or DataMatrix objects. PValues is a column vector or DataMatrix object. The fields PValues and FoldChanges will be either vectors or DataMatrix objects depending on the type of input PValues. ... mavolcanoplot(..., 'Labels', LabelsValue, ...) lets you provide a cell array of character vectors or string vector containing labels (typically gene names or probe set IDs) for the data. After creating the plot, you can click a data point to display the label associated with it. If you do not provide a LabelsValue, data points are labeled with row numbers from DataX and DataY. ... mavolcanoplot(..., 'LogTrans', LogTransValue, ...) controls the conversion of data from DataX and DataY to log2 scale. When LogTransValue is true, mavolcanoplot converts data from natural to log2 scale. Default is false, which assumes the data is already log2 scale. ... mavolcanoplot(..., 'PCutoff', PCutoffValue, ...) lets you specify a p-value cutoff to define data points that are statistically significant. This value displays graphically as a horizontal line on the plot. Default is 0.05, which is equivalent to 1.3010 on the –log10 (p-value) scale. ... mavolcanoplot(..., 'Foldchange', FoldchangeValue, ...) lets you specify a ratio fold change to define data points that are differentially expressed. Fold changes display graphically as two vertical lines on the plot. Default is 2, which corresponds to a ratio of 1 and –1 on a log2 (ratio) scale. ... mavolcanoplot(..., 'PlotOnly', PlotOnlyValue, ...) controls the display of the volcano plot without user interface components. Choices are true or false (default). Adjust the vertical fold change lines by click-dragging one line or entering a value in the Fold Change text box. Adjust the horizontal p-value cutoff line by click-dragging or entering a value in the p-value Cutoff text box. Display labels for data points by clicking a data point. Select a gene from the Up Regulated or Down Regulated list to highlight the corresponding data point in the plot. Press and hold Ctrl or Shift to select multiple genes. Zoom the plot by selecting Tools > Zoom In or Tools > Zoom Out. View lists of significantly up-regulated and down-regulated genes and their associated p-values, and optionally, export the labels, p-values, and fold changes to a structure in the MATLAB® Workspace by clicking Export. 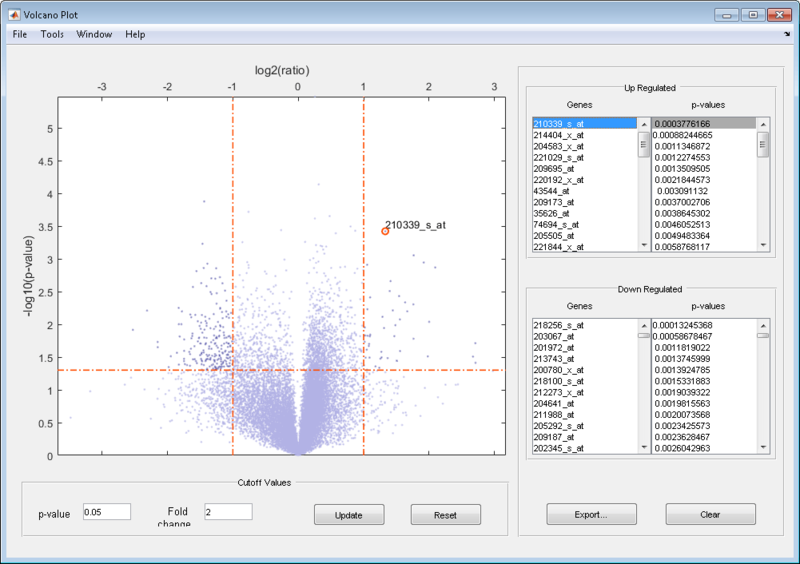 Load a MAT-file, included with the Bioinformatics Toolbox™ software, which contains Affymetrix® data variables, including dependentData and independentData, two matrices of gene expression values from two experimental conditions. Use the mattest function to calculate p-values for the gene expression values in the two matrices. Using the two matrices, the pvalues calculated by mattest, and the probesetIDs column vector of labels provided, use mavolcanoplot to create a significance versus gene expression ratio scatter plot of the microarray data from the two experimental conditions. View the volcano plot without the user interface components. The prostatecancerexpdata.mat file used in the previous example contains data from Best et al., 2005. Cui, X., Churchill, G.A. (2003). Statistical tests for differential expression in cDNA microarray experiments. Genome Biology 4, 210. Best, C.J.M., Gillespie, J.W., Yi, Y., Chandramouli, G.V.R., Perlmutter, M.A., Gathright, Y., Erickson, H.S., Georgevich, L., Tangrea, M.A., Duray, P.H., Gonzalez, S., Velasco, A., Linehan, W.M., Matusik, R.J., Price, D.K., Figg, W.D., Emmert-Buck, M.R., and Chuaqui, R.F. (2005). Molecular alterations in primary prostate cancer after androgen ablation therapy. Clinical Cancer Research 11, 6823–6834.